People talk about prudence, disappointment, inconclusiveness, and so on, but let me admit that I, for one, consider the existence of a Higgs boson of mass near 125 GeV to be a sure thing. It's not sure according to the stringent standards of discovery in particle physics but I think you would be very bold at this point if you made a bet that there is no Higgs boson of a nearby mass. Phil Gibbs' tricollider galactic combination chart makes the point very clear. 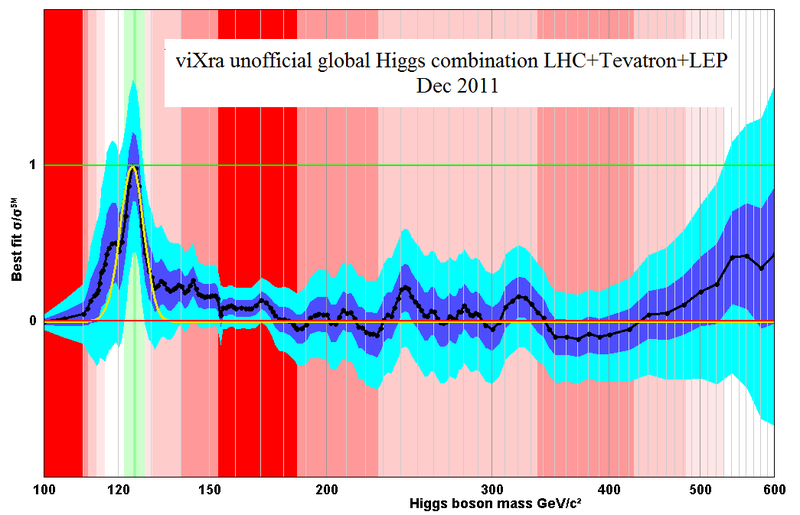 The \(x\)-axis in these graphs is always a possible mass of the Higgs boson. The \(y\)-axis shows the cross section \(\sigma\) for the production of objects that behave just like a decaying Higgs boson of the mass depicted on the \(x\)-axis. For each value of \(x\), the \(y\)-axis is linearly redefined so that the cross section \(\sigma\) corresponding to the Standard Model with no Higgs of mass \(x\) is shown at the horizontal red "0" (No) line while the cross section in the Standard Model that does include processes involving the Higgs boson of mass \(x\) is drawn at the horizontal green "1" (Yes) line. The cross section (for a certain outcome) measures the probability that the collisions of the particles at the accelerators produce the corresponding final states (in certain units). In this case, we talk about all possible final states ("channels") that could come from a decaying Higgs boson. Related video: Brian Greene explains the near-discovery of the Higgs at CNN. He's an excellent communicator, indeed. Experiments have actually observed the cross section given by the black curve. 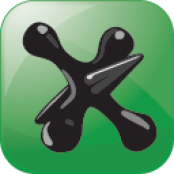 You should check, for each value of the mass \(x\), whether the black line is closer to the "Yes" green line or the "No" red line. It will never quite coincide with either of these two lines because there's always some noise, some statistical and systematic errors. To have an idea about the expected accuracy, the observed black curve (cross section) is drawn together with the dark blue and light blue bands. They correspond to the measured cross section plus minus 1 standard deviation or 2 standard deviations, respectively. Phil Gibbs approximates the probability distributions for the cross sections by a Gaussian function, i.e. 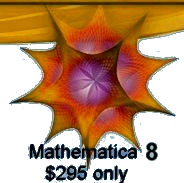 their shape is qualitatively given by the function \(\exp(-x^2/2)\). That's not quite true but I think it's a legitimate first step how you may treat the error margins quantitatively. The CERN professionals acknowledge the non-Gaussian character of the distributions (e.g. the difference between the Poisson-like distributions and Gaussian ones). But as far as I can say, the advantages of doing so are minimal: Phil's approximation ends up being almost exactly equal to the final one, anyway. CERN's folks tell you: kids, don't play with such combinations at home. On the contrary, TRF encourages as many children as possible to try to play with similar combinations in the way they find logical. Moreover, the Gaussian nature of the distribution gets better if the relative error margin gets smaller; and if you combine many experiments (because of the central limit theorem). Gibbs-like Gaussian methods can only become "very bad" if the final official graphs have very non-uniform thickness of different parts of the 1-sigma and 2-sigma bands, and it's usually not the case, and whenever it's the case, we know that the answers for the given mass remain inconclusive, anyway (look e.g. at 119 GeV in the graph above). The exclusion of the Higgs exceeds 5 sigma or so in some extreme corners, like the 150-180 GeV interval (predicted to host the Higgs e.g. by Alain Connes). But the graphs also show the much more interesting places on the \(x\)-axis where the black curve is closer to horizontal green "Yes" line. It's the case near 125 GeV. Above 116 GeV but below 127 GeV, one can't eliminate the possibility by more than 2-sigma. Much of the information about physics in this "far left" corner of the graph is provided by the shutdown colliders LEP (electron-positron collider that was running in the LHC's tunnel a decade ago but was replaced by the LHC magnet) and Tevatron (proton-antiproton collider near Chicago closed a few months ago). Those defunct colliders wouldn't tell us almost anything about the higher-energy physics, e.g. above 150 GeV (where one year of their running only brings us information comparable to hours or days of the LHC) but they're still useful to eliminate the low-mass Higgses where the LHC is kind of awkward. Around 125 GeV, Phil's graphs are strictly incompatible with the "No" red line \(y=0\). You see that the red line for this value of \(x\) is strictly outside (below) the thicker cyan 2-sigma band. In fact, it is approximately 4 standard deviations away from the black curve. 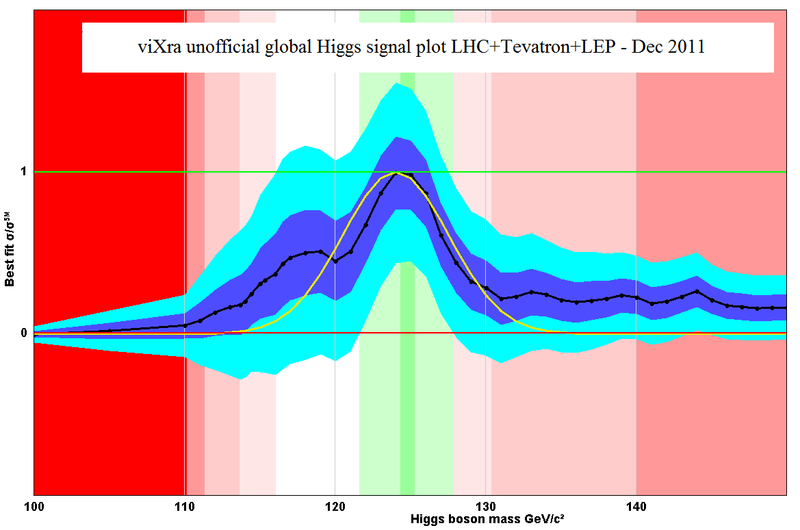 You may say that the possibility that there's no Higgs near 125 GeV is excluded at a 4-sigma i.e. 99.994% confidence level. If you punished the results for the look-elsewhere effect, it could drop to 99.9% or so. But it would still be over 3 sigma. And this is not a random bump at a random place, a randomly fudged chronology of a randomly found bristlecone pine tree somewhere in Canada. This is the inclusive analysis of all the searches for the most eagerly awaited new particle in high-energy physics. In such situations, I would claim that 3 sigma does mean 99.7% certainty and 4 sigma does mean 99.994%. 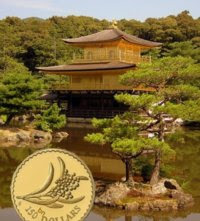 The only way how it could be totally wrong is a qualitative mistake of the hardware or the people – something that could occur even with 10-sigma signals. There is one potential mistake of being "too reticent" in such considerations. ATLAS says that they have a signal at 3.6 sigma "locally" which is reduced to 2.3 "globally" when the look-elsewhere effect is taken into account. CMS has lower numbers, like 2.6 sigma "locally" and 1.9 sigma "globally". (All these numbers are combinations from all channels.) You may want to add the lower numbers, 2.3 and 1.9, in quadrature. But that would be too cautious. If the locations of the signals agree, and they pretty much agree they're near 125 GeV, you shouldn't punish both experiments by the look-elsewhere subtraction. I don't want to justify a better formula in detail but it's more accurate to say that you pick 3.6 sigma from ATLAS and 1.9 sigma from CMS, for example. When you combine them in quadrature, you get an excess that slightly exceeds 4 sigma, and this already has the look-elsewhere punishment incorporated in it (only once, not twice). So I do think it's right to say that the LHC offers us approximately 4-sigma evidence of Higgs-like not-so-new physics near 125 GeV. Again, this is equivalent to 99.994% certainty. In climate science, social sciences, or other pseudosciences, a 1-sigma bump (68% "certainty") would often be enough to claim that something shocking is going on (a consensus may be made about it) and a 2-sigma bump (95% "certainty") is enough to burn all skeptics at stake. We're talking about 99.994% certainty here. It's not a "real certainty" but it would surely classify as "extremely likely" or more in any discussions in the IPCC, and the Higgs search is arguably based on meticulous, honest science rather than dishonest cherry-picking and fudging. The graphs will be gradually getting sharper and less questionable but they will never be "supersharp". I find the existence of a Higgs in the 122-127 GeV window, to be very generous here, to be a done deal by now. The truly nontrivial research in 2012 and later, from 2015 on, will be whether the Higgs near 125 GeV is the only new thing that the LHC is going to discover. The Standard Model with a near-125 GeV is marginally consistent with other constraints (except for the existence of dark matter) and it may be stable up to a scale that is very close to the Planck scale: 125 GeV is very close to the critical value for which stability may be guaranteed for all physically meaningful energy scales. If I return to the main theme, I do think that new physics beyond the 125 GeV Higgs boson should be discovered by the LHC (overall odds for any new physics beyond the Higgs are 75% in my opinion). Because I am a theorist, the most important reason for this statement of mine is that the high-energy physics, near the quantum gravity scale, makes a "pure" Standard Model very unnatural. And there are empirical or phenomenological reasons, too: apparent gauge coupling unification, existence of dark matter, and emerging hints of new physics such as new sources of CP-violation in LHCb, direct dark matter detection experiments, multilepton excesses at CMS, muon's mismatched anomalous magnetic moment, and a few others. In combination, they can't quite tell us the whole story but they do indicate that the Standard Model isn't the whole story. Just an example: the four-charged-lepton ZZ-channel excess of the ATLAS Collaboration boils down to three events where the reconstructed Higgs mass is 123.6, 124.3, 124.6 GeV, respectively. [Sorry, these are ATLAS figures.] (Note that the latter event at 124.6 GeV is one that was leaked by CMS' Tommaso Dorigo, but it wasn't quite the average one.) They fit into an interval whose width is 1 GeV and there are no other events of this type between 100 and 150 GeV or so. The probability that 3 random numbers in a 50-GeV window fit into a 1-GeV interval is 1/2,500 by itself, even when you include the look-elsewhere effect. Chances are 2,500:1 that there's something around 124 GeV. Now, this is just the "weaker channel" (when it comes to the strength of the current Higgs evidence) that should be added upon the even stronger ATLAS diphoton excess which is near 125 GeV, too (diphotons prefer 126 GeV but the ZZ-channel also prefers a slightly reduced Higgs mass, maybe due to a systematic error in the measurement of energy of leptons vs photons; leptons are more accurate than photons). It just happens that on this issue, I agree with Tommaso Dorigo and disagree with Matt Strassler. Dorigo has also picked the same unifying graph by Phil Gibbs and called the evidence supporting the 125 GeV Higgs "firm". One may debate what the word "firm" means. It may mean a "company". As an adjective, it means something that you shouldn't take lightly, that you're unlikely to beat. Of course, no dictionary can tell you "how unlikely". At any rate, I think that Matt's comments of the type "90% of [anonymous] experimenters he knows have told him that 99.994% isn't firm evidence" are preposterous. The latter figure, 99.994%, is much more relevant for deciding about the firmness of the evidence than the former number, 90%, which is purely sociological. Moreover, I tend to agree with Dorigo that those 90% are shy types who just endorsed whatever they heard from an "authority" in the room and Matt could have been the biggest macho in the room (it's possible in HEP physics). Also, I agree with Dorigo that it's bizarre for Strassler to criticize Dorigo for not warning against "fake discoveries", not-too-great hintst that later go away. Dorigo has done so hundreds of times – and so has your humble correspondent. Incidentally, we often agreed with Dorigo, and when we disagreed (e.g. in the case of CMS lepton jets), I was right and Dorigo was wrong. ;-) We just happen to be "believers" in this particular case. It's scientists' – I mean individual, independently thinking scientists' – responsibility to interpret the results of measurements (whether or not directors want to prevent them from doing so) and Dorigo is doing nothing else than that. And I happen to agree with him that the evidence may be described as "firm". I happen to prefer real (albeit imperfect) quantitative or visual arguments from real (albeit highly imperfect) physicists including Dorigo over some anonymous statistics about some unknown people's votes. And if science is supposed to remain operational, it is absolutely critical for the very individual experts who are supposed to contribute to science – and Dorigo is one – to have the freedom to express the results of their research and of their judgement. Dorigo's judgement is that the evidence is "firm" and it would be pathological if he were bullied by some abstract (and at this point, unproved) majorities or informal statements by official political organs of CERN. Science just couldn't operate well in this military setup, OK? How would Jesus deal with global warming? LHC: is \(\chi_b(3P)\) a new particle?